BRINGING THE BEAUTY AND HEALING PROPERTIES OF CRYSTALS, INTO YOUR LIVES AND HOMES! 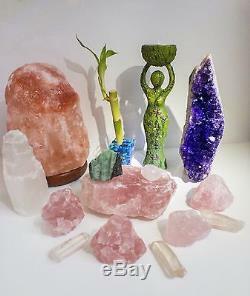 DIVINE MOTHER GODDESS CRYSTAL HEALING ALTAR. 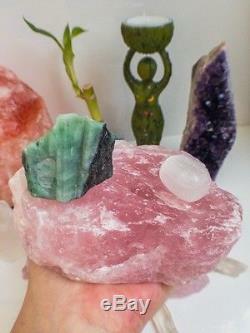 Here is another of the beautiful crystal altars I love to created for you. This one is created with the intention to bring the sacred feminine goddess energy into your bedroom. Created with lots of gemy quality Rose Quartz Crystals, a stunning large Amethyst standing cathedral. The large rose quartz at the center serves as a "crystal table" and is holding a selenite crystal ball and a gorgeous 100% real and genuine large Emerald crystal still on it's natural matrix! Absolutely an amazing emerald crystal specimen!! Around her you will find 4 medium rose quartz crystals and 3 tibetan clear quartz crystals. A beautiful himalayan salt lamp is also included in this crystal altar! A selenite tower to bring in the celestial white light, and a beautiful real bamboo plant set in a cute little container filled with blue colorful calming stones (these are stones for bamboo plants). This fantastic Goddess figurine is holding a candle on her hands, and have beautiful butterflies on her body. 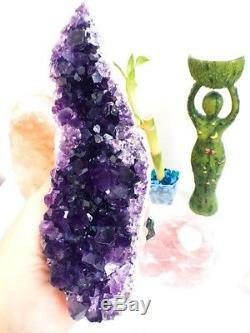 This Goddess crystal altar is meant to bring into your space the sacred feminine energy of the goddess, and the positive energy and healing benefits of the crystals that comes with her. IDEAL TO BE PLACED ON YOUR NIGHTSTAND, OR TO CREATE A SACRED ALTAR SPACE IN YOUR BEDROOM. 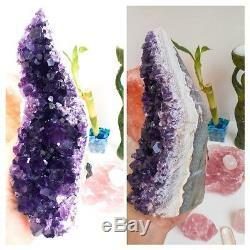 MATERIAL: 100% Authentic Super High Quality Crystals. SIZE: The goddess measures 7 inches tall. 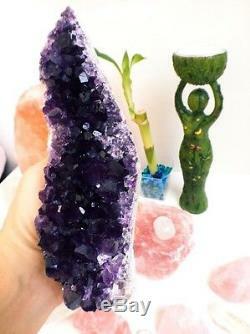 The amethyst cathedral is 7 x 2.5 inches and weights 1. The large Rose Quartz measures 5 x 4 x 3 and weights 1. The bamboo plant is about 5 inches tall by itself and 6.5 with the container that comes in. IMAGES: All images taken in my home, actually this crystal altar was placed on my own nightstand next to my bed as a display. The crystals are larger in person that what they look in the pictures. No filters used, taken with my iPhone. Much beautiful in person, your satisfaction is 100% guarantee! I love what I do and this is how I take care of my family as well. I believe in offering an outstanding customer care so you are always welcome to contact me. Always a pleasure to be of help. ABOUT FEEDBACK: if you have any problem with any order please contact me and I will try my best to work with you to resolve any problems. I pride myself of having an outstanding customer care, and you are always welcomed to contact me. The item "Divine Mother Goddess Crystal Altar, Crystal Healing, Rose Quartz, Love Crystals" is in sale since Friday, December 16, 2016. This item is in the category "Home & Garden\Home Décor\Other Home Décor". 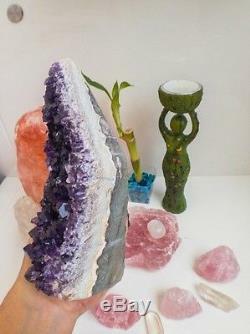 The seller is "healing-crystals" and is located in Miami Beach, Florida. This item can be shipped worldwide.